Baby-wearing has been practiced around the world for centuries. While the biggest benefit to baby-wearing is convenience, studies have shown that keeping your baby close to you helps to strengthen the bond between mom and baby. A baby who is being held cries less and feels calmer and more secure. Some slings are also designed to allow you to breastfeed hands-free. But nothing beats the convenience of having a safe and warm place to keep your baby while you are carrying groceries or washing dishes. You won’t have to worry about transporting strollers around, and carrying the extra weight will help postpartum moms lose those extra pounds accumulated during pregnancy. There are literally hundreds of different options for baby-wearing and navigating through these choices can be pretty confusing. The type of carrier you choose is based entirely on personal preference and your particular needs. The best way to choose a carrier is to just try out all of the different types. Some women have different carriers for different purposes. Basically, there are six different types of carriers: ring slings, pouches (or basic slings), wraps, mei tais, buckle carriers, and back carriers. Some carriers are convertible and can be used in multiple positions (for example, a wrap may be positioned on the front, back or side of your body). A convertible carrier may be a good option for you if you plan to continue using the carrier as your child gets older since the front position is better for infants and the side or back positions are usually better for older children. Regardless of which style you choose, make sure you follow the manufacturer’s instructions for use to make sure you have your baby in the safest and most comfortable position. Also, there are some great websites on the art of baby-wearing and tips for making your own sling (see www.thebabywearer.com and www.mothering.com). Carriers can also come in a variety of materials, including organic cotton, hemp, bamboo, linen and silk. Avoid carriers made from synthetic materials, such as fleece or polyester, since these fabrics tend to not breathe as well as natural materials and they often contain harmful chemicals that will off-gas and come into contact with your baby’s skin. Also avoid carriers with stain and fire resistance treatments, since these typically use toxic ingredients. For a list of manufacturers of more natural carriers, click here. Ring slings are usually made up of one long piece of fabric that you loop through rings at one end. They are adjustable while you are wearing them and fit a wide range of sizes. Ring slings can be worn in a number of different carrying positions, which can accommodate your baby from infancy through the toddler years. Some ring slings have an open tail or a strap for adjustment and others have a sewn strap that is not adjustable. The tail can be useful for covering up while nursing and is also more adjustable but the tails tend to slip and some moms find them too bulky. Below is a list of manufacturers of ring sling carriers. You can purchase ring slings made from organic and natural materials by clicking here. In March of 2010, the Consumer Product Safety Commission (CPSC) issued a warning about slings as well as a recall of Infantino slings (a type of “bag sling”). They warn that parents should exercise caution when using slings for babies under four months of age because such carriers can present suffocation dangers. Fourteen deaths over the past 20 years have been associated with the use of certain types of slings. However, most of the babies suffered from low birth weight, were born prematurely or had breathing issues. What we can take from this news is not to stop using slings but to take more care in how we use them and what kind we use. Until now, no standards have existed for the manufacture of baby carriers. The CPSC is now working to develop these standards. The CPSC recommends that baby’s face should be visible at all times and not covered or pressed against the wearer’s body. Parents should also frequently check their baby while in the sling. Take care to make sure baby is not curled up tight as this can restrict baby’s breathing. The Infantino sling that was recalled is a perfect example of what to avoid – a sling with deep pouches, excessive fabric and elastic sides. Slings like this one can force babies into a curled position restricting their oxygen flow. 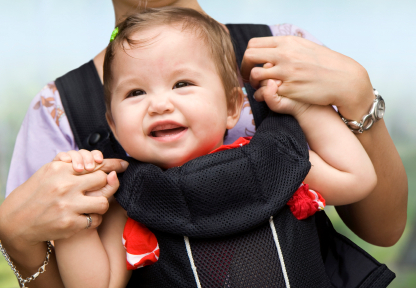 For more information about wearing your baby safely, consult with your pediatrician. Also, specialty shops that sell baby carriers often have experts that can help with fitting and wearing carriers. There are literally hundreds of different options for baby-wearing and navigating through these choices can be pretty confusing. The type of carrier you choose is based entirely on personal preference and your particular needs. The best way to choose a carrier is to just try out all of the different types. Some women have different carriers for different purposes. Basically, there are six different types of carriers: ring slings, pouches (or basic slings), wraps, mei tais, buckle carriers, and back carriers. Some carriers are convertible and can be used in multiple positions (for example, a wrap may be positioned on the front, back or side of your body). A convertible carrier may be a good option for you if you plan to continue using the carrier as your child gets older since the front position is better for infants and the side or back positions are usually better for older children. Regardless of which style you choose, make sure you follow the manufacturer’s instructions for use to make sure you have your baby in the safest and most comfortable position. Also, there are some great websites on the art of baby-wearing, baby-wearing safety, and tips for making your own sling (see www.thebabywearer.com, www.babywearinginternational.com and www.mothering.com). Carriers can also come in a variety of materials, including organic cotton, hemp, bamboo, linen and silk. Avoid carriers made from synthetic materials, such as fleece or polyester, since these fabrics tend to not breathe as well as natural materials, and they often contain harmful chemicals that will off-gas and come into contact with your baby’s skin. Also avoid carriers with stain and fire resistance treatments, since these typically use toxic ingredients. Ring slings are usually made up of one long piece of fabric that you loop through rings at one end. They are adjustable while you are wearing them and fit a wide range of sizes. Ring slings can be worn in a number of different carrying positions, which can accommodate your baby from infancy through the toddler years. Some ring slings have an open tail or a strap for adjustment and others have a sewn strap that is not adjustable. The tail can be useful for covering up while nursing and is also more adjustable but the tails tend to slip and some moms find them too bulky. Below is a list of manufacturers of ring sling carriers. Pouches are the simplest and most user-friendly carriers. They are very similar to ring slings but consist of a single loop of fabric. You just put the loop over your head and tuck baby in. Some pouches are adjustable and others come in different sizes. They tend to be easier to deal with because you can just put them on and go rather than having to buckle or zip things. They can be used in a variety of carrying positions and are great for nursing moms. If you choose a non-adjustable pouch, you may have to purchase different sizes to accommodate your growing baby and your changing body. Some fabrics are stretchier than others and thus may be more comfortable for your baby. Below is a list of manufacturers of pouch/tube slings. A wrap sling is a long piece of fabric that you can wrap, tie and knot in a number of ways. Wrap slings are the most versatile of all carriers and will accommodate a variety of carrying positions and weights. The downside is that they can be complicated to figure out and hard to get used to. You will have to be choosy about the fabric because some are stretchier than others, making them great for infants but not as supportive for bigger children or for back-wearing. Below is a list of manufacturers of wraps. Mei tais are Asian-inspired carriers that can be worn on the front, back or hip. Mei tais are a combination of wraps and pouches – they consist of a rectangular piece of fabric and four straps that wrap around your body. They are arguably more ergonomic than a pouch because they wrap around both shoulders rather than just one. Below is a list of manufacturers of mei tais. Buckle carriers are similar to mei tais but with side release buckle closures. Like mei tais, they can be worn on the front, back or hip. Buckle carriers are one of the easier carriers to use. There are no rings to deal with or ends to tie. For that reason, they are the most common type of carrier found in baby superstores and department stores. Below is a list of manufacturers of buckle carriers. Most of the carriers listed above can be used in the back position. Also available are framed backpack carriers, which are a great option for parents who like to take long walks or hikes. These carriers often have small compartments for diapers and similar items and some have larger compartments for essentials for an all day outing. Backpack carriers may also have extras such as a sun/rain hood and drink reservoirs. You should take into consideration the weight of the carrier as well as which extras you will need because the price can be substantial. Below is a list of manufacturers of back carriers.